Times and rates for small claims cases vary from county to count in the US. On AVERAGE it can cost between $10-$20 to file a small claims case. From the date of filing you can expect your day in court anywhere from 45-90 days after filing - again these are AVERAGES and can vary depending on many factors. Again I am not a lawyer, but I did work as a Senior Paralegal for a firm in NYC while completing my PhD. And a warning to ANYONE claiming to be a lawyer and doling out advice online... EVERY state in the USA has strict laws regarding the Unauthorized Practice of Law (UPL). If you truly are considering legal action against NCSoft PLEASE consult with a licensed attorney either on the phone or in person before doing anything. Please do not take the word of people on an internet forum claiming to be lawyers; they could easily do more harm to your potential case than good. And AGAIN please consider calling your financial institution and inquiring about disputing the charges for any unpaid subscription time. I again will caution anyone about trying to dispute the purchase of paragon points; because if NCSoft fights it and can prove they provided you with the service; irregardless of when (even 8/30/2012) your financial institution could not only deny your dispute but could also discontinue servicing your account on the basis of filing a fraudulent dispute. So what am I saying?? If you are owed subscription time: Either speak to an attorney face to face or contact your financial institution regarding disputing any unused sub time you paid for in advance. If you are going to attempt to get reimbursement on a purchase of paragon points: Please speak to an attorney face to face. Case or not... if someone was planning to go this route, start now. By the time you get anywhere on a case like this is will be after November, if your lucky. The leagal system moves like some threw caltrops down in front of it. I believe my husband has 18 months paid ahead. I have an entirely different situation. When I signed the contract to create the "Guest Author" arc, as part of my payment I was given a "lifetime" subscription, which in the fine print was five years. There are still three years of that to run. With the closure date I should be offered equivalent compensation, and I am not sure if fraud/"bait and switch" holds here, but it might. Not that I expect to get anything out of it, but I can certainly generate some ill-will when my fans learn I was cheated, should that come to pass on Dec 1. Mercedes yours is a truly unique situation as you were compensated for a service provided...I truly hope you can get your situation resolved through a competent attorney. If going through your financial institution is not possible regarding your husbands prepaid subscription time...I am hopeful that the legal system will grant you the financial relief he deserves. Actually the announcement has been on the NCSoft launcher since 8/31/2012 - whether you decided to read it or not was your choice. But 1) the story isn't on the news page, 2) the feature they want us to see here is that Nature Affinity is available on the Paragon Market, 3) the other features they want to draw attention to are Amplifiers, Water Blast, and More Enhancement Trays. If "we put the story on the launcher, it's not our fault if you didn't see it" was legally binding, we wouldn't have to click to confirm that we'd read the EULA when it changed. "Hey, we put a link to the EULA right there in the launcher, it's not our fault if you didn't see it and confirm that you read it," said no game company ever. At any rate, the only way anyone can find out about the closure right now is by either logging into the game, or selecting City of Heroes in the launcher and looking very, very closely at what's in the lower right column. If someone isn't doing that (let's say, for example, they're on a business trip, vacation, working a ton of overtime, otherwise distracted and unable to log into the game right now), they have no way of knowing what's going on unless they frequent the forums or follow the CoH feeds on Twitter or Facebook. Regardless of whether or not email address change over time, they'd still get better coverage by sending out email to every address they have on file. Edit: And, just for the record, I'm neither supporting nor attempting to dissuade anyone from considering legal action. I'm just pointing out flaws I see in an argument. Not to mention further that even if it was there, them going "Buy this new powerset!" 3 days before they're like "OK, all of you GTFO. Pool's closed, you don't have to go home but you can't stay here! ", is a bit shifty either way. There's certainly an argument to be made for the bait and switch, presuming of course, they don't sell the IP and Code to another developer, or rescind their closing of the game, which the passing of each day and the more developers and artists that find employment elsewhere becomes more and more unlikely. Keep in mind, breach-of-contract and partial breach penalties are calculated on the concept of returning the involved parties to their standing prior to the harm caused by the breach. Harm will be calculated by prorating the unfulfilled amount of the contract. Fraud has a whole different set of rules, and is much harder to prove. My coursework hasn't done a lot on that topic yet. That's like saying a distracted driver shouldn't be held accountable if they run a red light. The information is right there in the top spot of the NEWS section. NCSoft has covered their bases by notifying people through the launcher as well as by stopping all recurring payments effective 8/31/2012. All I am saying is that one does not have an actionable case by stating "I was not informed directly by NCSoft" because all players have been given notice and all billing has ceased. The only people who have a legitimate grievance imo are those with account time paid in advance after 11/30/2012; to which I have repeatedly suggested getting in touch with their financial institution and/or speaking to a real live attorney face to face and not someone who claims to be one on the internet. My goal here is to interject a lil bit of reality into a passionate group who sometimes seem to think they have a multi million dollar case because their game is closing down. There are no punitive damages to be sought...there is no property to reclaim...the only LEGITIMATE claim anyone has is time they paid for after 11/30.2012. Grrr there is no BAIT AND SWITCH at play here. Even if you bought Nature Affinity on 8/30/2012 you still have 3 months to play it. There is no guarantee of you are buying this set for 120 days...or 1 year. Same goes for Paragon Points....you bought them and can still use them; which is why the store was left open. Whether you choose to use them or not is your choice. Whether NCSoft chooses to give you credit in another game for them...is their choice. Is it morally correct?? Depends on who you ask. Is it legally actionable...imo no. But if you seriously think you have a case; by all means seek out an attorney in the real world....it's your money/time. All I am saying is that one does not have an actionable case by stating "I was not informed directly by NCSoft" because all players have been given notice and all billing has ceased. If they weren't already paid up ahead of time (multiple month subs) and have opened the launcher specifically to the CoH page. You won't see any notice at all if you don't open the launcher. You won't see any notice at all if you open the launcher to start up Aion. And if you've paid in advance, not seeing NCsoft bill your credit card this month is business as usual. This isn't like someone running a red light they didn't see. This is like someone driving the normal speed limit through a school zone that was "clearly" marked by a sign that was hiding behind a tree that had grown over it. And most financial institutions should be able to help you resolve this issue without ever stepping foot in a courtroom..and in a MUCH more expedient manner. Part of that unique situation is that she has a guy whose job it is to look at her contracts with a microscope. Maybe it would be useful to hear what he has to say. There was already someone who posted on the official boards that they got their money back on unused VIP time. It seems to have gotten eaten in the fuffle that happened from the troll who posted the falsehood that people wouldn't get refunds. YOU WILL GET REFUNDS. The troll posted a falsified comment from a GM - a comment that was never made - and has been banned. We have angered The Toast! Now, see, if I see a refund show up on my credit card from NCsoft, that might clue me in, but I don't expect to see that until after Nov. 30. "Reasonable Effort" it is a legal term... look it up NCSoft has made a reasonable effort. As part of that effort I am willing to bet that prior to November 1, 2012 a bulk email will also be sent out notifying anyone on their mailing list of the closure. I find it very hard to believe that in the next 6 weeks people who have 3-6-12 month subs will not find out about the closure; whether it be through the launcher, an email, reading an article online, twitter, etc etc etc. And to those people I will continue to suggest the same thing...talk to your bank/credit card company or a licensed attorney in your area. Considering that her situation is unique and not applicable to you or me...it bears no legal relationship to our situation. If/when she is compensated it is because she had a contract with NCSoft for 5 years (roughly $900) of game time as payment for her authoring services. NCSoft never guaranteed the average player that the game would be around next week or next year. There are a lot of 'what ifs' going on right now. 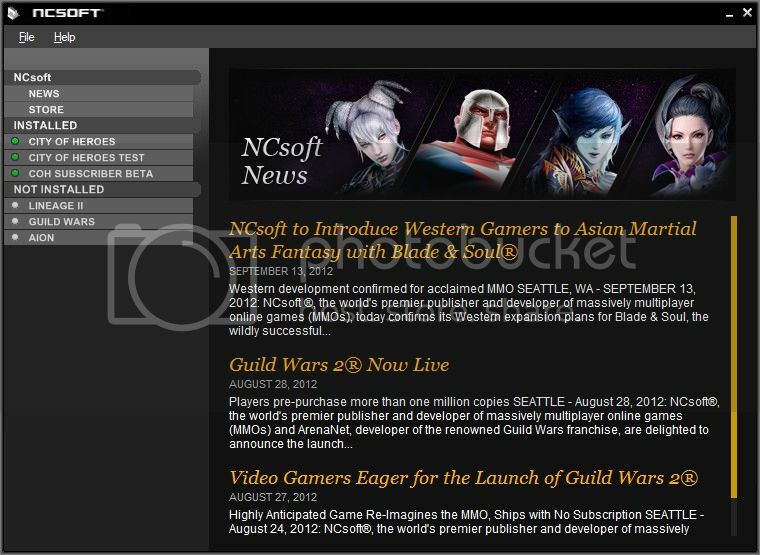 The most important, hinging on 'what if' NCSsoft says thanks for the money, you long term subscribers, now go play GW2. If they offer refund, or give a choice for refund or a higher equivilant of game play, then it makes it harder to do. The way I see it, this would only apply to long term subscribers. Nature affinity, paragon points, etc, probably will not warrant a legal position. Its a fair long shot in either case, but interesting to look at. there are those of us who bought VIP time in bulk. Now players are having their accounts set as VIP and/or their renew dates removed. So essentially we paid for a service in advance that has now been rendered free. If we had been paying month to month, there would be 3 months we did not pay for the service, but we are now since we paid in advance. There anything that can be done about that, aside complaining to NCSoft? I'm still waiting for a real lawyer to weigh in on this. I know there are a couple here. Forgive me but the minute you preface your words with "I'm not a lawyer but...." it just becomes "In my opinion as someone who watches a lot of TV." law is not my profession, though I have taken classes in law and I gave as helpful information about this case as possible, it's technically an internet crime and therefore is normally un-prosecutable, though you could sue for bait and switch based on their actions, technically they have amnesty because internet bait and switch is not recognized in the court of law. for best results you should address the issue from the Internet tax law's perspective because then the court will recognize that this is a law suit against a business rather than an internet organization. as I hinted in my first post the internet is almost completely lawless and unregulated.